Advances in remote sensing technologies have allowed us to send an ever-increasing number of satellites in orbit around Earth. As a result, Earth Observation data archives have been constantly increasing in size in the last few years, and have become a valuable source of data for many scientific and application domains. When Earth Observation data is coupled with other data sources many pioneering applications can be developed. In this paper we show how Earth Observation data, ontologies, and linked geospatial data can be combined for the development of a wildfire monitoring service that goes beyond applications currently deployed in various Earth Observation data centers. The service has been developed in the context of European project TELEIOS that faces the challenges of extracting knowledge from Earth Observation data head-on, capturing this knowledge by semantic annotation encoded using Earth Observation ontologies, and combining these annotations with linked geospatial data to allow the development of interesting applications. Kyzirakos, K, Karpathiotakis, M, Garbis, G, Nikolaou, C, Bereta, K, Papoutsis, I, … Kontoes, C. (2014). 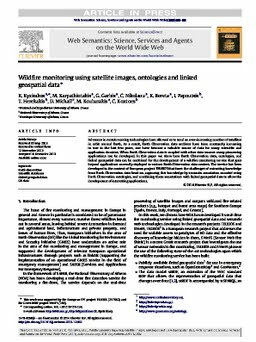 Wildfire monitoring using satellite images, ontologies and linked geospatial data. Web Semantics: Science, Services and Agents on the World Wide Web, 24, 18–26.